Since for operations we contain a definite nomenclature for transitions and places. tbi, j , k presents the beginning of operation Oi, j , k .
tei, j , k presents the end of operation Oi, j , k .
pij, k presents the kth initial place of Jj presenting the beginning of the job type Jj, that is the job type Jj is ready. p j,k presents the k last place of the Jj that is it presents the end of Jj. In essence this means that the job is ended. pfi, j, k presents the operation place presenting Oi, j , k .
pni,j,k presents the k intermediate place of Ji after jth process. pri presents the resource places for the ith robot. pmi presents the resource places for the ith machine. At this time pri is drawn twice just for the clear representation and is in reality a single place. The number of tokens in the firstly place shows the lot size of the consequent job. A token in the operation place shows the exact operation being performed. A token in the middle place shows that the part is ready for the subsequently process, that is the intermediate place shows the buffer. 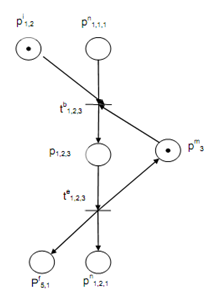 By utilizing the notation explained above we implicated all places and transitions as shown in Tables no.2 and 3, respectively. This has been previously stated that a job representation can contain more than single initial or final place. For instance, suppose that the operation indicated by p1, 2, 3 needs an extra partly completed job as this is an assembly operation. 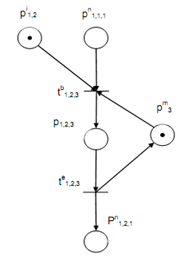 After that the consequent Petri net model of J1 can be modified as represented in following figure (a). Now additional raw material needed is indicated by place pi1, 2. Likewise we can show one more situation. 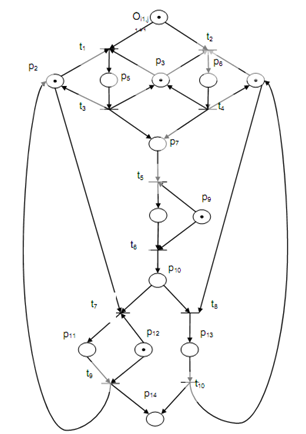 If the new job type J5 shares the similar genetic sequence of processes along with J1 upto the operation shown by p1,2,3 and does not need any additional processing, the consequent part of the Petri net model can be represented in following figure (b). These situations rather often appear in chemical processes where a process produces a byproduct. We have related time delays along with places. A token in a resource place or an intermediate place is readily available. A token in the operation place is available merely after a delay that consequents to the interval time of the operation. We offer this duration time related with the operations in Table no.4.